How efficient is your maintenance in the age of Industry 4.0? 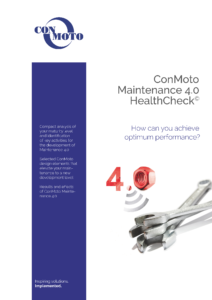 Find out by taking the ConMoto Maintenance 4.0 HealthCheck©! Especially within the fields of maintenance and asset management, technical progress has generated numerous possibilities to improve the quality of maintenance in line with the plant efficiency and productivity in production. Still, most companies do not make sufficient use of the potentials that Maintenance 4.0 and predictive asset innovation offer. Within the scope of our ConMoto Maintenance 4.0 HealthCheck©, we will support you with a compact, implementation-driven analysis in evaluating the Maintenance 4.0 maturity of your organization and identify a course of action for improvements. Objectives, fields of action and effects: Identification of innovation priorities, systematic assessment of your potentials and derivation of target areas. The key figures of your maintenance, your Maintenance 4.0 maturity level and a clearly defined course of action for future development are the central results of our Maintenance 4.0 Health Checks©. By presenting the results and discussing them with your employees and the management, the ConMoto Project Team is giving the impulse for change in your company. Additionally, the joint Maintenance 4.0 core team is planning the necessary implementation steps. You can download our comprehensive brochure containing further information about the Maintenance 4.0 HealthCheck© here.